We are Allan & Doris Kammerer from Beachwood, New Jersey, new members of the “Americana Family”. From 1972 to 2006 we traveled in motorhomes. For the first six years we rented different motorhomes and for the next twenty eight years we owned four different Class A coaches. In 2006 we sold our last coach with the idea that our traveling days in a recreational vehicle were over. By 2008 we realized our decision to stop RVing was the wrong one. Having been homeowners for 49 years we finally came to the realization that we could survive very nicely without the expense of maintaining a large empty house. After wrestling for several months with the thought of what to do with all the “STUFF” we had gathered over 53 years, we made the decision to become full time RVers. Before we began looking at RVs, we developed our specifications of what we would require in our coach. Obviously, having traveled only in motorhomes we began our search for a motorhome that would meet our requirements. Our search didn’t last very long. Motorhomes could not come close to meeting our requirements. We eliminated the conventional travel trailer and set our sites on a fifth wheel trailer. We received literature and prices on many different fifth wheels. The first question we would ask a dealer was how to level the coach from left to right. When they told us you had to use blocks it ended our interest in their product. We had stopped leveling motorhomes with wood blocks in 1990. As we continued our search, we came across the AMERICANA web site. After reviewing the excellent videos of all aspects of the construction and operation of the AMERICANA along with discussing the many questions we had with Jerry LeMar we made the decision to purchase a new 40’ RT Americana. We had never purchased a coach without seeing, touching and driving it but based on the excellent information we received from the videos and our discussions we made the decision to purchase. The idea of buying direct without a dealer being involved was very appealing to us. 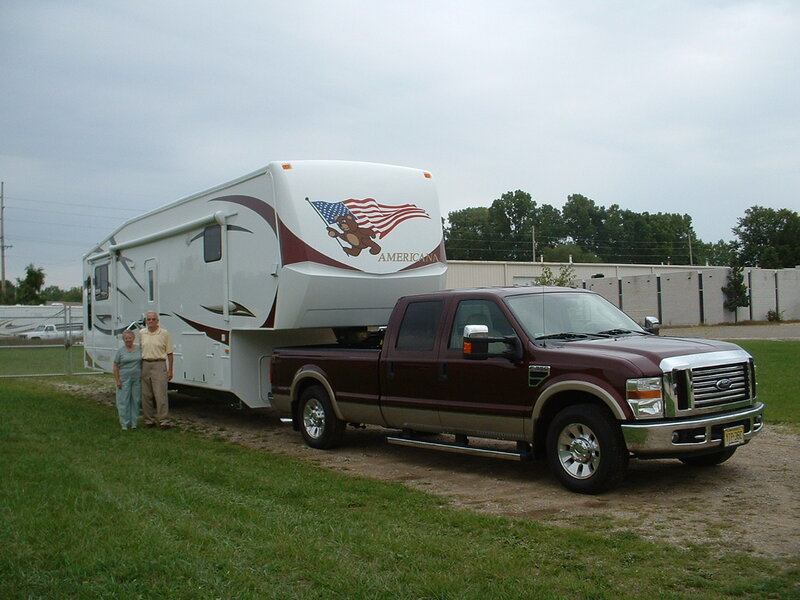 We placed our order in February 2009 and took delivery of our new coach in August 2009 at “RV America Inc” in Elkhart ID. The delivery was made personally by the owners of the company, Jerry LeMar and Rus Anderson. They spent the entire week with us going over all aspects of the coach and checking us out on hooking up, unhooking and driving the coach. We lived in the coach during the week and any problems we had were immediately taken care of by Ron Green, owner of RV America Inc. and his very capable staff. In all our years of Rving this has been our most enjoyable experience. We sold our home, distributed many of our memories to our family, had an estate sale for what remained and are now thoroughly enjoying our new full time travel adventure. As we write this we are on our way to San Diego for the winter.